Clinatec develops new treatments, diagnostics and research methods for applications in oncology, neurodegenerative disease and spinal-cord injury. The Clinatec biomedical research center is like no other facility in the world.  R&D is conducted by the CEA and the Grenoble University Medical Center oversees clinical trials. Clinatec develops new treatments, diagnostics and research methods for applications in oncology, neurodegenerative disease and spinal-cord injury. A multidisciplinary team made up of clinical practitioners, biologists, mathematicians and engineers in microtechnology, nanotechnology and signal processing has been constituted at the platform to drive innovation in micro and nanosystems for healthcare. The platform’s unique approach—bringing together a broad range of know-how at a single location—fosters the emergence of novel solutions and speeds up proof-of-concept testing and transfer of new technologies to manufacturers. The ultimate goal is to offer new solutions to as many patients as possible. Clinatec possesses a broad range of equipment and leverages the know-how and advances of the MINATEC campus. An open project center provides access to Clinatec’s resources. Partners can assign their staff to or house their projects at Clinatec for predetermined periods of time. This open-access policy helps attract young, talented professionals and drives the diversification of research topics addressed at Clinatec. Clinatec’s current research includes near-infrared neurostimulation to stop degeneration, an exoskeleton and brain-computer interface to help tetraplegics walk again and biomarkers for brain tumors.